A look at The Unholy Murder of Ash Wednesday. Detective DiPaolo arrests Anthony "Nigsy" Armone, charging him with putting out the hit on Dovishaw. "Erie was never safer than when the mob was in charge." I've heard that sentiment echoed by at least three generations of Erieites since I arrived here a decade ago. The problem is that there never was a "family" – no Cosa Nostra, no mob – in Erie. There was a collection of local wiseguys, wannabes, and career criminals, most of whom had the potential to be better than who they were. Some of them were born into crime. Some of them found it on the playgrounds and on the streets. Most of them attempted to live up to the mystique of a rough and tumble Erie underworld. Some of the guys who worked Erie's streets after World War II knew people, important people in the LaRocca family in Pittsburgh, and in the Licavoli crime family in Cleveland, as well as the Youngstown faction of the Pittsburgh crew. But none of those families set up shop in Erie. It was the 1950s. Manufacturing was king. Downtown was bustling and "the city was wide open," says former Erie detective and Magisterial District Judge Dominick DiPaolo. DiPaolo and former Erie Times-News editor Jeff Pinski are co-authors of DiPaolo's memoir, The Unholy Murder of Ash Wednesday: The Stained Life and Rude Times of Mob Wannabe "Bolo" Dovishaw. Because the city had no dominant crime family, an open market for gambling, theft, and sometimes drugs created a laissez-faire environment where criminals flourished and cops chased their tails. In 1954, Erie's Mayor, Thomas Flatley, was arrested – alongside several people in his administration, top brass at the police station, and members of the city's crime syndicate – on charges of corruption, abuse of power, and illegal gambling, to which he pleaded guilty to charges of conspiracy and violating his oath of office, leaving him to resign facing jail time and fines. In the decades that followed, many citizens of Erie suspected that their elected officials remained "connected" to local bookmakers and other conspirators, but none would go down in the sensational way that Flatley had. The numbers racket was the primary vehicle for Erie's local brand of organized – and sometimes disorganized – crime. This was before Pennsylvania sponsored its own lottery, and customers bet every day for a chance to win the 5 to 1 payout. In local shops, factories, and pubs throughout the city, old ladies bet pennies, kids traded nickels, and laborers put down dollars on a chance to walk away with the daily take. All they had to do was pick the right number – the last three digits of the next days' stock market at the closing bell. Many played in the mid-twentieth century, but the game belonged to guys like "Bolo" Dovishaw. Dovishaw lived in Erie's Little Italy. From his west side neighborhood, Dovishaw controlled the local gambling book – including sports-betting and numbers – and became one of the most successful bookmakers in northwestern Pennsylvania. Little Italy was Erie's only self-contained ethnic neighborhood in those days. Anything its inhabitants needed – a haircut, a butcher, a priest, and even a hitman – could be found within the confines of the neighborhood's borders. Geographically, the neighborhood ran from the train tracks south of 12th Street to 24th Street, with an eastern boundary at Sassafras Street and western front around Cranberry Street. Future cops like Dominick DiPaolo and future criminals like Ceasar Montevecchio played together in Columbus Park as kids, they played baseball in the Glenwood League as teens, and, as adults, they chased and evaded one another on those same streets. "There was no similar area on the east side," says Pinski. "Little Italy had its own public schools, its own church, its own funeral directors, its own stores. You never had to leave." But in order to keep tabs on the numbers game and ensure that the East Side Italians and Polish kept their hands off their racket, guys like "Bolo" Dovishaw and his partner in crime, Ray Ferritto, had to leave the confines of the west side. The city belonged to them, they believed. There was a business to run. Dovishaw had more than one-hundred people taking bets for him. Maintaining a small army of criminals – one that included everyone from cops to kids – required a routine. It meant that every day, Dovishaw had to make the rounds and take the calls that would satisfy his ego and his wallet. Ferrito left the neighborhood for different reasons. He had the connections. He had skills that made him useful to people in Cleveland and Los Angeles. From burglary to murder, Ferritto carried out the wishes of "made guys," the kind of mobsters who provide cinematic lore and legacy. But they were interested in Ferritto, not his small time gambling associates, not Erie. In that way, Ferritto was the most worldly of his Erie criminal brethren. He lived everywhere from Warren, Ohio to Los Angeles. He did time in the California State penitentiary at Chino. When the Irish Mob led by Danny Greene moved in on the Cleveland crime family of "Jack White" Licavoli and Angelo "Big Ange" Lonardo, it set in motion the machinations of a classic mob war. There were more than 40 car bombs in Cleveland in the early 1970s, several of which were intended to take Danny Greene's life. Eventually Cleveland called Ferritto to finish the job. And he did. Ferritto's legend preceded him in Erie. When he wasn't moonlighting for the mob, he partnered with "Bolo" Dovishaw. Who would dare challenge such a dastardly dynamic duo? There, in part, lay the foundation of Erie's love affair with its mob. To the extent that various criminal elements competed for space in the city, they did so mostly under the radar of media and police. So on the surface the city appeared safe. If one wannabe wiseguy steals from another's goods and cash that were the product of illegal activity, who was the victim to call? The police? It had to be handled internally, away from civilians. If a group of kids mug a guy on his way to or from one of Erie's downtown, second floor gambling haunts, the guys in charge of the game would deal with it. Mischief and mayhem were bad for business. After Ferritto was released from Chino in 1974, he returned to Erie where he and Dovishaw developed their routine. They were partners and because their business required a routine, Ferrito usually knew where to find Dovishaw. January 3, 1983 was like any other Monday for Erie's biggest bookmakers. They collected on the numbers racket, they stopped at Damore's pizza shop for a meatball sub because "Bolo" Dovishaw was a "fat pig [who] was always hungry," and they prepared for Monday Night Football. The Cowboys were playing the Vikings, Tony Dorsett was hot, and the action was going to be large. Dovishaw dropped Ferritto off at his home at 6 p.m. so Dovishaw could get to his house and answer the phone. That's how the bets were made. Never in person. Only by phone. In those days, there were no answering machines. That would only provide evidence. Furthermore, old school analog guys like Dovishaw and Ferritto were probably averse to such technology. If the phone rang too many times, the call could be transferred to another number. If Dovishaw didn't answer, one of his associates surely would. An hour after Dovishaw dropped off Ferritto, Ferritto called Dovishaw to check on the action for Monday Night Football. But the call got transferred to their underling. Dovishaw was nowhere to be found. Did he run off with his gypsy stripper, Chastity? He wouldn't trade money for that kind of action. Did he get pinched by the local cops – or even the feds? The FBI had been hunting La Cosa Nostra for more than a decade, but usually big players in big cities, not little connected numbers guys in nether regions like Erie. 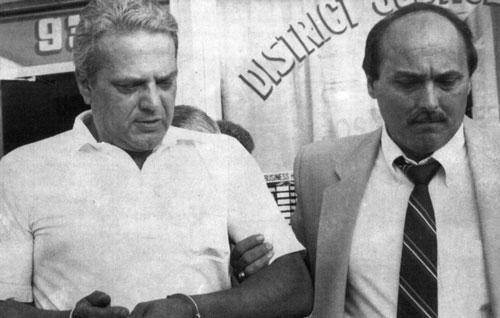 In part, the focus of the federal government on the Italian mob allowed for challenges to power like the one Danny Greene tried to carry out in Cleveland or the kind of coup "Whitey" Bulger executed in Boston. But there was no "family" in Erie. As Ferritto searched for Dovishaw, becoming at once more concerned and more angry by his partner's absence, he decided it was time to head to Dovishaw's house on West 21st Street. The house belonged to Dovishaw's mother. She was deceased. Dovishaw had lived there alone. He also died there, alone. Ferritto searched the house and found his friend and associate bound in the basement, his hands tied with the belts of his mother's dresses, which were still hanging on a rack downstairs. "Bolo" Dovishaw had been shot once behind the ear, on his knees, execution style. The sordid tale of the events that preceded Dovishaw's murder and the investigation that followed is the subject of The Unholy Murder of Ash Wednesday. It is "a cop's memoir." Connecting the characters introduced, dug up, and put away in this story of old Erie crime creates a roadmap that leads from Erie's dark past to its darker present. Erie may never have had a mob umbrella under which to hide on rainy days. But today's disorganized criminal enterprise, steeped in drugs and searching for order, makes the organized crime of old a nostalgic ride with some familiar faces. Readers of DiPaolo's story, as told to Pinski, are sure to recognize many of the people and places in the book. They might even find themselves within those very pages. Jim Wertz can be contacted at jWertz@ErieReader.com, and you can follow him on Twitter @Jim_Wertz.